For handling several designs from one task or workflow, Designs has a folder system. 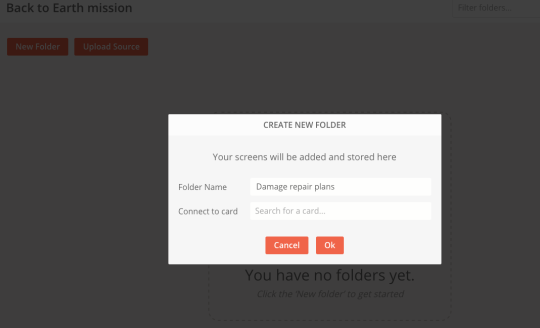 You can create however many folders you need and then simply upload or drag&drop the designs into the right folder. Need to share the source file itself? No problem! Just upload or drag&drop the file, and anyone in the project gets access to it. Once you’re done, connect the folder to the related cards on the Plan board or Work board so your colleagues and clients can access it. Need to keep a lot of folders in order? With basic functions like edit, download, archive and delete you can tailor any folder at all and with drag&drop you can organize them with ease. Looking for something from months ago and have like a hundred folders? Don’t spend valuable time searching through them. With the filter feature, you can easily find any folder in just a few simple clicks. The designs you uploaded basically behave the same as the folders. 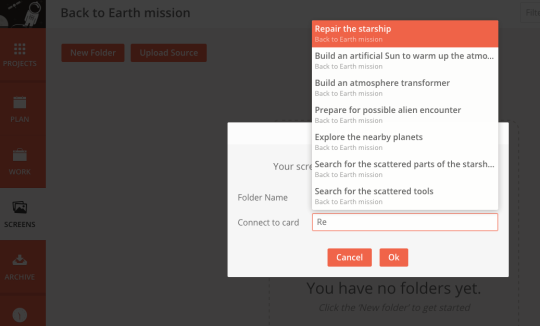 You can upload or drag&drop your designs (even more at one time) into the folder. With designs you also have the basic modification options and the drag&drop feature for easy organisation. And you can find any design you’re looking with complete ease, by using the filter feature. Now comes the best part: what you can do with a design. Besides the basic zoom (Ctrl+scroll) and navigate (left-right arrow) functions you can create a comment thread (double click) on any part of the image. In the thread, you can discuss any design related issue, change requests or share ideas. Use the mention feature to notify a teammate about the comment and get your project moving in the right direction. When the discussion is over you can clear up the comments by marking it as resolved and after it will appear as checked. When the project or task is closed, you can archive the folders and designs in them. Afterwards, they will appear in the ‘Archive’ module under the designs folder and designs tabs ready to be reopened any time. Designs is available now for all Nostromo teams, so feel free to try it out and get a bit of extra order in your organisation. If you run into any trouble or have further questions, our Help Centre article on Designs is the place to start. We’re always happy to help.